State Sen. Daniel Biss (D-Evanston) and U.S. Rep. Jan Schakowsky (D-Ill.) walk in the Chicago Tax March on Saturday. The two politicians were among a number of speakers calling on President Donald Trump to release his tax returns. CHICAGO — Large protests rarely begin with the Chicken Dance, but Saturday’s Tax March in Chicago’s Richard J. Daley plaza was an exception. The march — attended by thousands of protesters — called for President Donald Trump to release his tax returns. 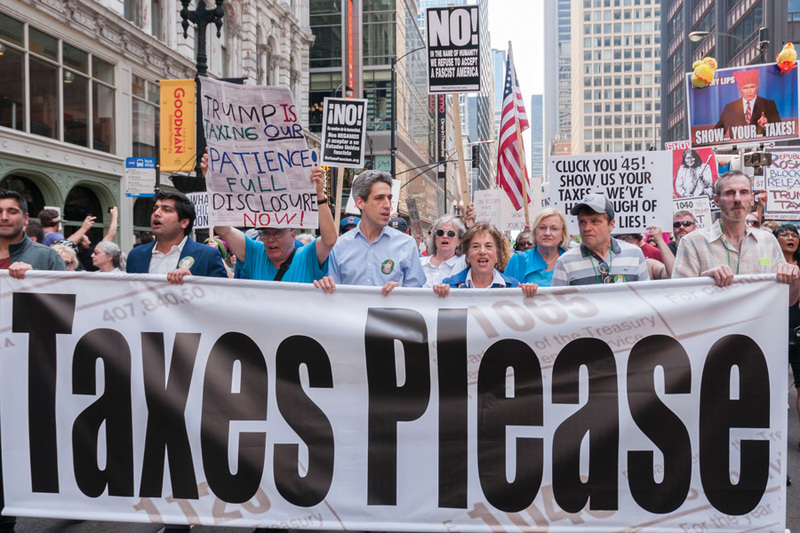 It was one of about 200 such marches held across the country ahead of Tax Day on Tuesday. U.S. Rep. Jan Schakowsky (D-Ill.) and State Sen. Daniel Biss (D-Evanston) spoke, as did Rep. Mike Quigley (D-Ill.) and the Rev. Jesse Jackson Sr.
“Stop being a chicken, Mr. President, and release your tax returns,” the Chicago protest’s organizer Taran Singh Brar told the crowd, standing next a 30-foot inflatable “Chicken Don.” The float was crowdfunded by more than 80 people ahead of the Saturday march. Sousaphones Against Hate — a Chicago-area brass band formed to resist the Trump administration — led the crowd in the Chicken Dance, following with the Beatles’ smash hit “Taxman.” Other demonstrators chanted “Chicken in Chief” while holding signs that read “Grab Him by the 1040,” a reference to the IRS filing form. Brar, a documentary filmmaker, told The Daily he is not a professional activist, but that with some hard work, anyone can start a protest and mobilize thousands of people. In addition, Brar said the release of tax returns is a non-partisan issue supported by a majority of Americans, which makes it especially compelling. Trump, in a break with tradition, has consistently refused to release his tax returns. Though presidents are not legally required to make their returns public, Trump is the first president in 40 years not to do so. He has repeatedly claimed that only the media was interested in seeing his returns. Michael Mellini, a Chicago resident who attended the protest, said he disagrees with Trump’s statements. In his remarks, Biss condemned the president’s lack of transparency. On Friday, the Illinois gubernatorial candidate released five years of his tax returns as part of an effort to restore trust with voters. He has also filed a bill that would require presidential or vice presidential candidates in Illinois to release their tax returns to qualify for the ballot in Illinois. Biss told The Daily he expects the bill to pass in the Illinois State Senate, saying it would be politically embarrassing for Gov. Bruce Rauner to veto the bill. Rauner has consistently released his two-page 1040 tax returns since his gubernatorial candidacy in 2013. At the event, Schakowsky said the public needs to know if Trump is exploiting his presidency to enrich his private interests. Without the president’s tax returns, she said, Americans have no way of knowing the extent of his ties with Russia. “We have to see them because we need to know: How much money is Donald Trump and his family and his cronies making if they were able to repeal Obamacare, if they were able to repeal Meals on Wheels for senior citizens?” Schakowsky said.